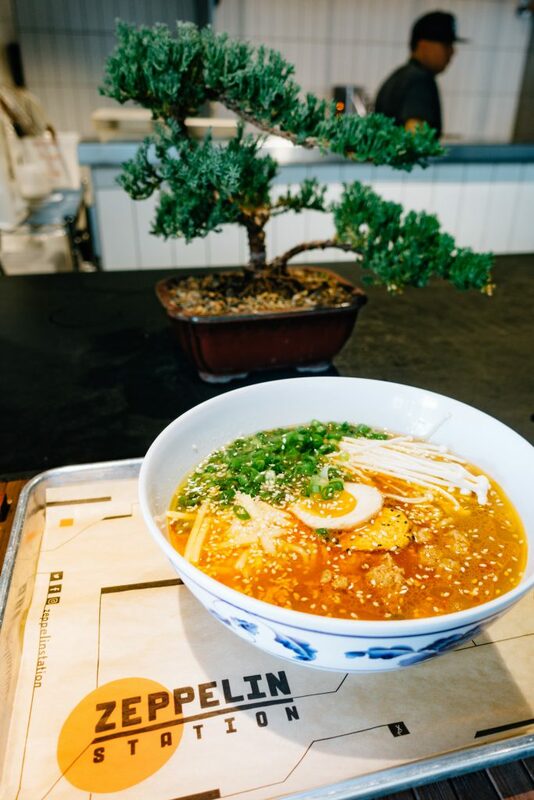 The search for the Best Ramen in Denver continues. When I first heard about Gaijin Ramen & Yakitori at Zeppelin Station, I was immediately intrigued. 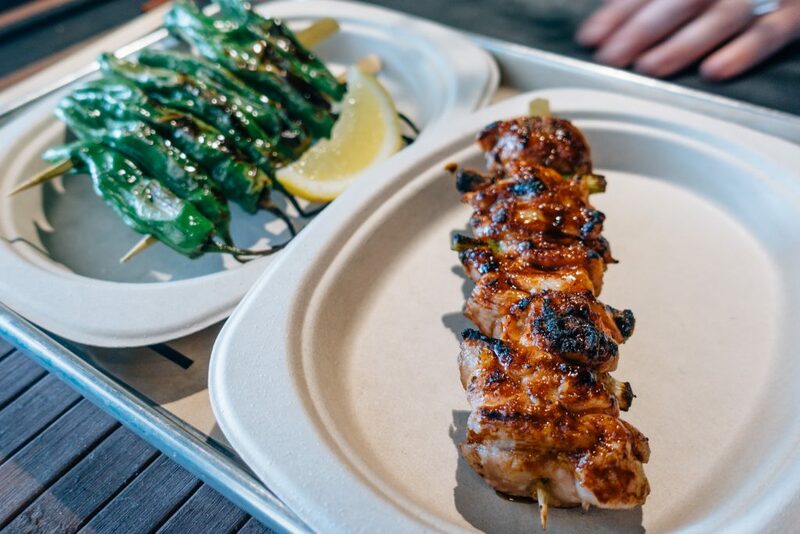 Chef Bill Espiricueta has an impressive background, having worked in the kitchens of Acorn in RiNo as well as the Japanese restaurant Nobu, and his recently opened Denver-based BBQ joint, Smok, at the Source Hotel. 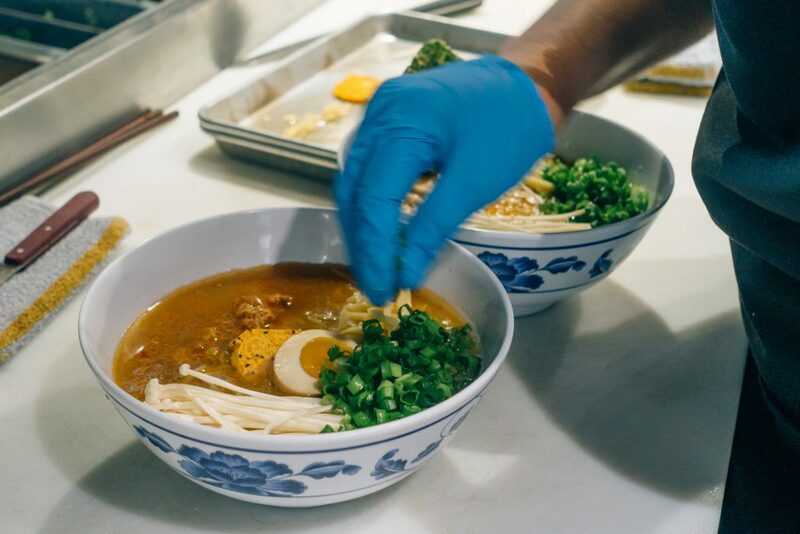 During the Smok pop-up at the Source earlier this year, there was a special ramen bowl that gained a lot of buzz on Instagram, and its success was part of the impetus for Chef Bill thinking about dishing out his ramen bowls on a more regular basis. With the opening of Injoi Korean Kitchen at Zeppelin Station already under his belt, when the opportunity arose for Chef Bill to take over the adjacent “No Vacancy” stall (which is dedicated to rotating food concepts in every few months), he thought it might be the perfect breeding ground for his idea for a ramen restaurant. Please note: Financial compensation was not received for this post. I was invited by the PR firm working with Gaijin to come in for a meal on the house. Opinions expressed here are my own. Although it is difficult to evoke a particular vibe when you’re just one of many stalls in a food hall environment, Gaijin tries to evoke the spirit of Japan as much as it can with a mini sand raking/rock garden, bamboo placemats, and charming collection of bonsai trees located on the counter near the cash register. Patrons order at the till and are then given a buzzer that rings when their order is ready to pick up, after which they are free to find an open table in the communal seating area on the ground floor. Please note – Gaijin used to be located right next to Injoi but has now relocated to the other side of the food stalls, opposite the retail shops. 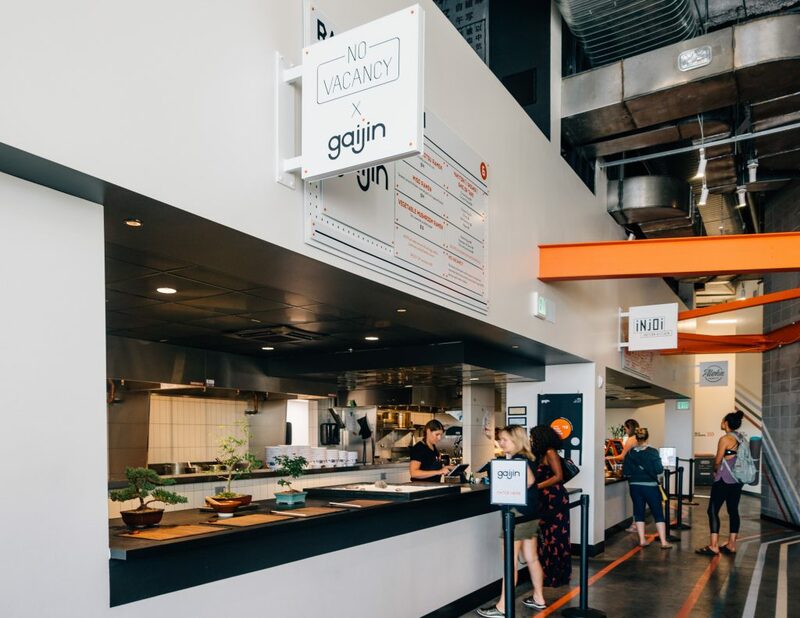 During my visit, I and my fellow blogger friend Michelle Jackson of Michelle Is Money Hungry and Square State, were treated to a tour of the Gaijin kitchen. Afterward, we sampled a number of dishes from Chef Bill’s stalls, including a plate of grilled Shishito Peppers (can’t go wrong with these!) and chicken thigh skewers (tender and great for sharing) from Gaijin, and some spicy wings from Inoji (liked these a lot). On a total side note – on a separate occasion when I ordered more food from Injoi, my husband became absolutely obsessed with the scallion kimchi Fried Rice. If you like your fried rice on the salty and savory side like my husband, you’ll want to check it out! The other great thing is it is vegetarian-friendly (it does contain eggs though)! But the main event was obviously the ramen. 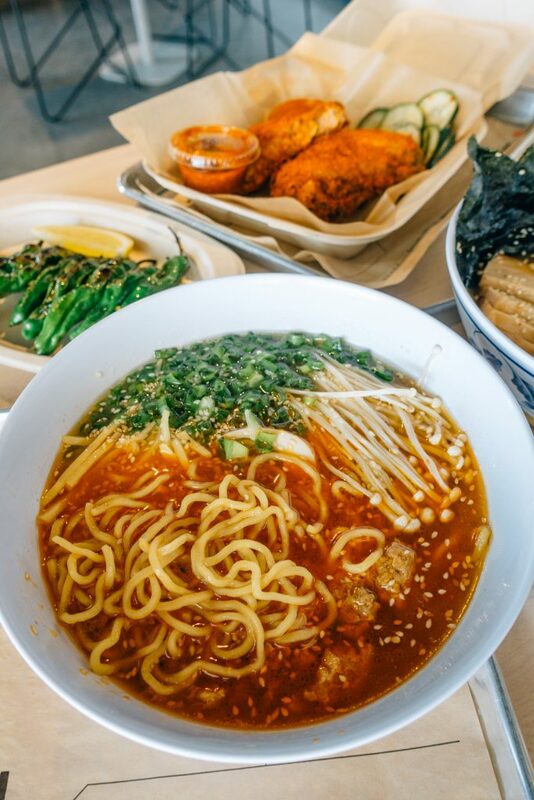 We tried out two ramens on the menu – the Chicken Tonkotsu ramen and the Miso ramen. I first started with the Tonkotsu ramen ($14) which features slices of braised pork belly. The broth was not a classic creamy, deep tonkotsu, a bit on the lighter side, which allows for the flavor of the pork pieces to be more clearly tasted. Although its description didn’t immediately capture my attention, the Miso ramen ($14) version pleasantly caught me by surprise. I felt it had a much deeper, striking flavor, aided by the pieces of tasty ground chicken featured in the bowl, and supported by some charred garlic oil, which gave the whole dish a memorable kick. Definitely my favorite of the two. 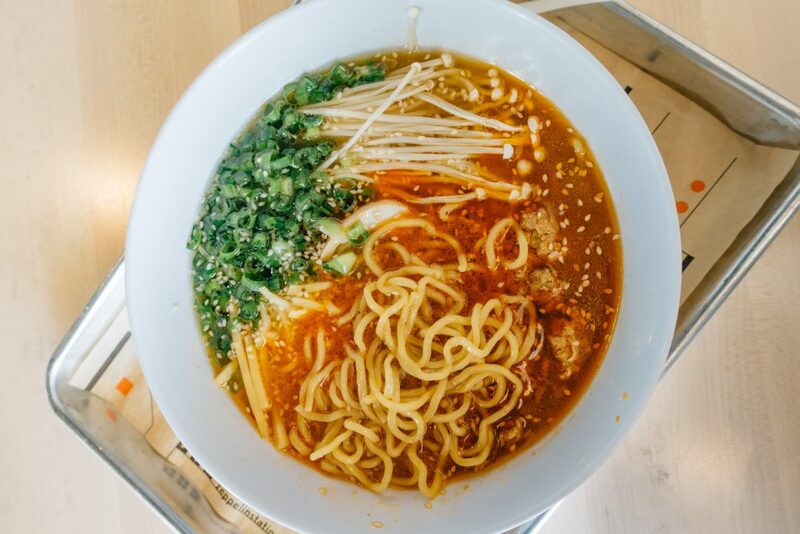 All-in-all Gaijin is a welcomed new entry into the Denver ramen scene. 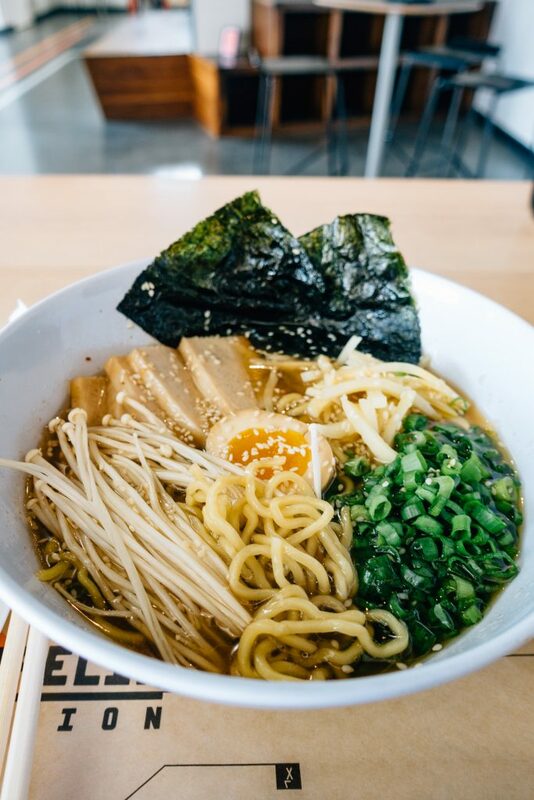 My preference is for the Miso ramen featuring the yummy little chicken pieces due to its more complex flavor and that little bit of additional heat. 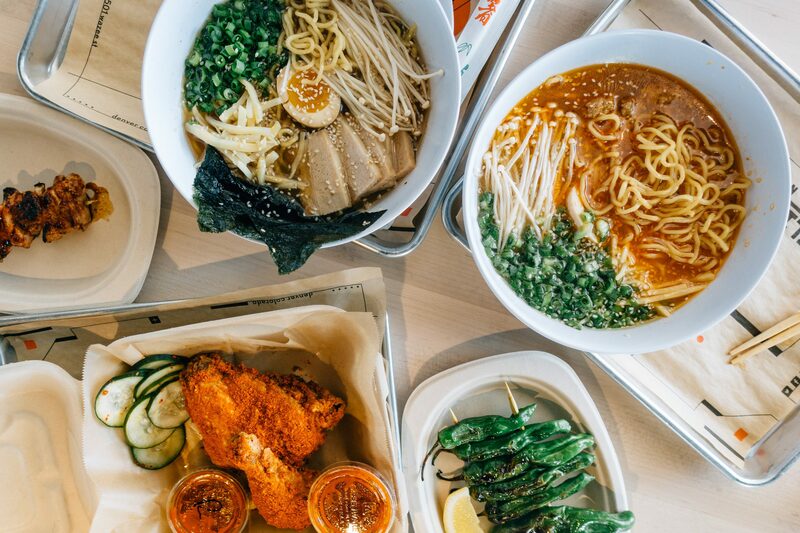 I very much like that there is a now a Japanese-inspired option at Zeppelin Station and think that Gaijin’s ramen is a satisfying option for those in the area looking to get a quick hit of noodles. Service is speedy and stress-free and the casual environment of the food hall makes it a great place to eat and meet up with friends. Why would I eat at a Japanese restaurant when Gaijin means non-Japanese? That would be similar to eating at a Mexican restaurant named Gringo Tortilla. True, Dave. I assume it’s supposed to be ironic in its name. Just because you’re not from there, doesn’t mean you can’t make good food. It’s also chef Bill’s take on Japanese cuisine – not necessarily traditional.